"Wake up!" Did you ever say that to yourself as you were about to doze off in a college class? How to stay awake and stay alert can be important for anyone in a class, at work or even on a drive home late at night. Alertness can diminish because of mental fatigue or a lack of sleep. Wouldn't it be great if there were a drug-free fatigue treatment? "Fall asleep!" Have you ever uttered those words in frustration when counting sheep just did not work? Sleep problems, insomnia and racing thoughts can make it hard to fall asleep. It would be wonderful if there were a drug-free way to go to sleep too. The study looked at two forms of acupressure and assessed their effect on alertness with students in a prolonged lecture environment. These students were enrolled in a course on Clinical Research Design and Statistical Analysis. As you might guess, they could use some help staying awake. The study used a set of five acupressure points that promote mental stimulation and compared them to a different set of five acupressure points that promote relaxation. What was especially interesting for me was that 7 of the 10 acupoints that they studied are all ready being used routinely in Quick REMAP. Below is an example of one acupoint from the stimulation set and one acupoint from the relaxation set that are used in the Quick REMAP 4-point Protocol (Quick REMAP Handbook). Both acupressure protocols took about 15 minutes each. The study showed that the stimulation acupressure protocol significantly reduced sleepiness, as measured by the Stanford Sleepiness Scale, compared to the relaxation acupressure protocol. I decided to test both approaches on myself. My first test involved staying up past my bedtime while reading research studied on my computer. Eventually I became too drowsy to concentrate. I then began activating the acupoints for alertness. In just a couple of minutes, I was alert again and soaking up what I was reading. I got lucky regarding my second test. I almost never have trouble falling asleep. But one night, my mind began zooming between one idea and the next. After about 30-minutes, I was frustrated by not being able to go to sleep. This provided a great opportunity to test the acupressure protocol for relaxation that was used in the study. I sat up in bed and began working with the second set of acupoints. Within a minute, I began to feel drowsy as my mind calmed down. Then, I was asleep in no time. I had success on both counts. I plan to write up a protocol for each of these procedures with acupressure point charts for each. When finished, I will make them available in a short booklet. 1. Harris RE, Jeter J, Chan P, Higgins P, Kong FM, Fazel R, Bramson C, Gillespie B. 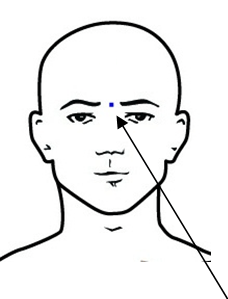 Using acupressure to modify alertness in the classroom: A single-blind, randomized, cross-over trial. Journal of Alternative and Complementary Medicine 2005;4:673-679.